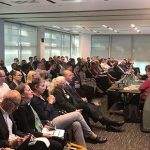 The regular RFG Members Meeting held during the Multimodal exhibition (1 May 2018) focussed on two main topics: the development and upgrading of both inland and port-based rail terminals, and how new technologies can improve the efficiency, safety and environmental advantages of rail freight. The meeting, held on 1 May 2018, started with a brief policy update from Maggie Simpson, RFG Executive Director. She outlined some of the current policy work that RFG has been leading on. Following on from recent comments by Department for Transport at RFG’s recent conference, she noted that there seemed to be increased interest in understanding freight needs in franchise bidding. She was also hopeful that the ORR’s review of access charges for the next control period would not be harmful to freight operations, when the draft determination is published on 12 June, although the details would need to be carefully reviewed. China’s ‘One Belt, One Road’ strategy was welcomed by Nichola Silveira, General Manager Logistics, DP World London Gateway, who explained that there are now 1,500 trains running from different Chinese provinces into Europe. London Gateway has recently launched a weekly service to/from Duisburg to link with the China services, working with CMA/CGM, and it is encouraging more rail operators to bring block trains into the port of London Gateway. David Cross of DC Consulting welcomed the opening of new inland rail interchanges and their vital role in the development of intermodal rail services. He said that they needed to be large facilities, at least 200 acres, with good road connections and labour supply, and European gauge capacity ideally. He encouraged all the attendees to spread the message about the benefits of rail freight. David also gave an update on the new facility at iPort which opened earlier this year. Paul Severs, Director, Solent Stevedores, explained how joining RFG had helped his company’s learning curve as it moved into rail, and undertook the huge job of upgrading the Southampton Rail Terminal to double its capacity while keeping it operational. The phased build programme included moving from side-lifters to reach stackers, overcoming the problem of curve overthrow. 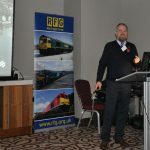 In the second session, Andrew Quinn from the Birmingham Centre for Railway Research and Education (BCRRE) at Birmingham University, explained that the research they have recently undertaken on the aerodynamics of freight trains is based on modelling but also generated by real trains on real networks. He said that calls for faster freight trains need to take into account that freight trains generate much more powerful slipstreams than passenger trains at the same speed, and the implications of this for freight trains passing alongside passenger platforms. Andrew also discussed recent work on passenger rail air quality, and the implications for rail freight. 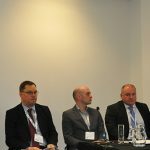 BIM – Building Information Modelling – and its relevance to rail, was explained by Trevor Strahan and Iain Court of BakerHicks. It uses 3D modelling (and 4D, including time, 5D cost, 6D asset management and 7D sustainability) to help construction and other industries increase efficiency and avoid potential problems. It can be used to help plan and model exact gauge clearance for freight trains. The last speaker Pieter Rypma, Key Account Manager, Siemens Rail Automation, talked about his company’s contract with Network Rail to install ETCS (European Train Control System) to freight locomotives. He said it would be installed in all freight locos (as well as passenger ones) to increase reliability and safety. It is a ten year plan and needs to be managed carefully as it is a step change for drivers. Thanks to all our speakers and to Clarion Events for sponsoring the meeting and lunch.